Screenplay: Jason Segel, Nicholas Stoller. Starring: Jason Segel, Amy Adams, Chris Cooper, Rashida Jones, Alan Arkin, Zach Galifianakis, Sarah Silverman, Emily Blunt, Whoopi Goldberg, Jack Black, Bill Cobbs, Jim Parsons, Neil Patrick Harris, John Krasinski, Judd Hirsch, Dave Grohl, Mickey Rooney. Voices: Steve Whitmire, Eric Jacobson, Dave Goelz, Peter Linz. It’s been a long wait (12 years) since the last theatrical Muppets movie and if this is the best they can come up with in that time, then I think the Muppets have had their day. It speaks volumes when Frank Oz, one of the biggest contributors to the furry little characters, dropped out because he was unhappy with the script. 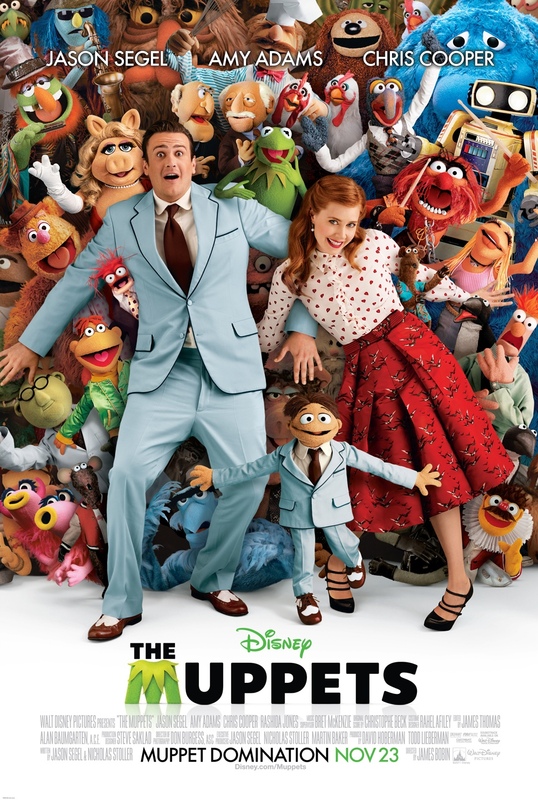 Gary (Jason Segel) is the Muppets’ biggest fan. On a trip to Hollywood, with his Muppet brother Walter (voiced by Peter Linz) and girlfriend Mary (Amy Adams), to visit his heroes’ studio home, he learns of a plot by evil business man Tex Richman (Chris Cooper) to destroy the Muppet Theatre and drill the land for oil. The only way he can save the day is to find the disbanded Muppets and get them back together for a benefit gig. ‘Kermit’, ‘Miss Piggy’, ‘Gonzo’ and ‘Fozzie’ etc make their way back onto the screen for a new generation of kids, but in all honesty, I think it was more appealing to the parents who will fondly remember these great little characters from the television show “Sesame Street” which first aired in 1969. However, there is such a lack of creativity in this adventure that both generations should be disappointed. Yes, it’s great to see them again but their humour is seriously lacking. There are a handful (if that) of entertaining moments. It starts reasonably well and looks like it will be a good old fashioned slice of family fun but after the first couple of song-and-dance numbers (that aren’t all that great) you realise that this is all you’re going to get. Amy Adams is an actress I admire but she’s given little to do, leaving the limelight on Jason Segel who completely hams it up with some terrible acting. Don’t get me wrong, I’m not expecting a thespian amongst a group of puppets but he seemed really self-conscious and out of sorts. The introduction of the latest Muppet ‘Walter’, was a decent device to be reintroduced to the old favourites again but it’s the lack of attention the “Sesame Street” gang are given that ultimately let’s the film down. The jokes are few and far between and the story (co-written by Segel) is weak and sluggish, to say the least. Added to which, the celebrity cameos – that have always served The Muppets so well – are even of a lesser standard. These old favourites deserve so much more. This has received remarkable adulation since it’s release and I have to say, I sit on the side of the sceptics. A very disappointing reacquaintance that lacks the heart and wonder that these fabulous little characters brought to so many. This entry was posted on March 2, 2012 at 5:08 pm and is filed under Adventure, Comedy, Family, Music with tags 2011. You can follow any responses to this entry through the RSS 2.0 feed. You can leave a response, or trackback from your own site. I’m so appalled that you didn’t like this. I had been hearing nothing but over-the-top praise regarding everything about it. Then again, I still have to see it. I’m surprised you didn’t like this. From your review and two-star rating, I see you REALLY didn’t like it, but it’s nice to see someone disagreeing with the masses. I’ll watch it this weekend. Let’s see what side I’ll be in. Haha okay. I guess I can see where you’re coming from. 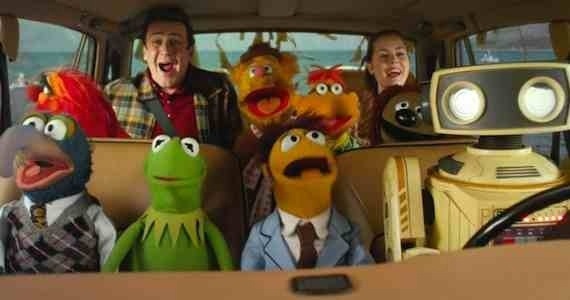 I saw The Muppets back in November and it become one of my favorite films 2011. One of the purest odes to cinema that year. Your two star review is something akin to giving The Wizard of Oz or The Sound of Music a bad review in my opinion. It just wants to entertain and it does so with such pure joy. Nothing (with the possible exception of The Artist) made me happier in 2011. I enjoy your reviews, but this one makes me very sad. I’m sorry you disliked it so much. I’m sorry to disappoint Mark, but believe me, I was very disappointed I didn’t enjoy this also. I was really looking forward to it but it didn’t really impress me. I grew up with and love The Muppets but I found this uneventful, to say the least. I watched it yesterday and loved it too. But I can understand why someone wouldn’t like it as much.